Everyone knows that keeping a New Year’s resolution is challenging. Whether we try at first then get discouraged when we don’t see immediate results or just fall back into bad habits, most people can’t find the motivation to stick with it for the full year. Storing your data in a cloud computing server saves you money, and just as importantly, time. You no longer have to worry about software and hardware maintenance and upkeep, instead leaving that to a cloud service provider who will have a team on standby 24/7. All you have to do is research and choose a trusted, HIPAA compliant cloud service provider to take care of your network. Be already experienced in the healthcare industry and fully HIPAA compliant. Allow you to access the most up-to-date versions of your technology. Work on the go from any device, anytime, anywhere. Provide you with a Disaster Recovery Plan so you’re business doesn’t shut down due to an emergency. There are many other ways how a cloud provider can improve your operations. Check them out here! Artificial Intelligence in the workplace is coming, and probably sooner than you think. It’s understandable to be nervous, you’ve seen Terminator and you also don’t fully trust that a robot can do a human’s job, especially when someone’s health is at stake. AI technology in the healthcare field is improving rapidly. IBM’s Watson has already been involved in a program with oncologists around the world and found that in the vast majority of cases, Watson and these physicians had the same diagnosis and treatment plans. If AI is already working on treatment for possibly the most complex and challenging diseases we know of, just imagine how effective it could be for someone with acid reflux or a sprained ankle. Even if Artificial Intelligence isn’t readily available for your healthcare business right this second, it will be soon, and when it does you should seriously consider adopting it for your network. Start worrying only if it starts talking in a heavy Austrian accent and demanding clothes and motorcycles. 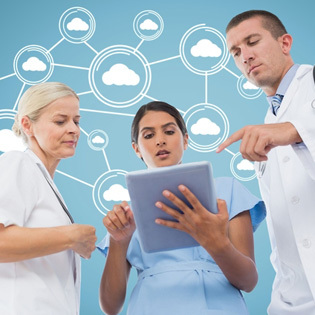 One of the beauties of cloud technology is that it can keep an open line of communication between doctors and patients through cloud-based apps. Patients will now be able to skip the unnecessary step of going to a doctor’s office to find out if they even need medical attention in the first place. This is beneficial for the doctors too. They will have more time to treat people who do require their attention, and it will allow hospitals to schedule visits on need instead of whoever scheduled an appointment first. In conclusion, these three resolutions, if kept, will have your business operating faster, smarter, and more securely. If you have any questions about the cloud or about the specifics of how it can help you, feel free to call TOSS C3 at 1-888-886-8677 or by email at sales@toss.net.